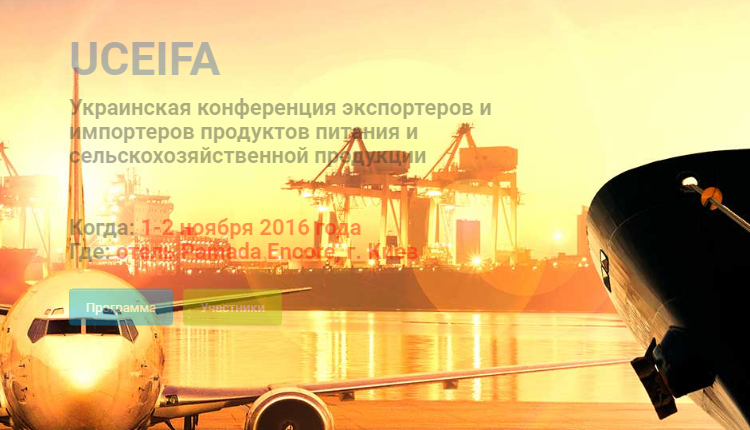 In November, 1-2, 2016 in Ramada Encore hotel (Kyiv) will take place international conference of Food and agroproducts exporters and importers - UCEIFA.Organized by FPR-Events. Management of exporting company and food purchasers, packaging and technical solutions suppliers, representatives of state autorities, retail, distributors and trade missions will participate conference. UCEIFA – practical experience for managers of the new generation – who looks forward, plans and develops the company. Who is ready to use new opportunities for export-import who is ready to take best from experience of colleagues, and also to receive a lot of new business contacts among the Ukrainian and foreign companies. During the conference it is planned to consider the most frequent hot questions of food import. Representatives of the Ukrainian retail c and purchasers food and agroproducts will meet foreign suppliers. Also are planed parallel discussions in the directions of export during which exporters, importers, retail and purchasers of food can provide their companies, hold productive negotiations and find many new business contacts. You can find preliminary program, payment details and other information at official website http://uceifa.com/ . We invite you to take part! Register at law price period!